At TechEd Europe 2014, Microsoft announced the General Availability of Network Security Groups (NSGs) which add security feature to Azure’s Virtual Networking capability. Network Security Groups provides Access Control on Azure Virtual Network and the feature that is very compelling from security point of view. NSG is one of the feature Enterprise customers have been waiting for. What are Network Security Groups and how to use them? 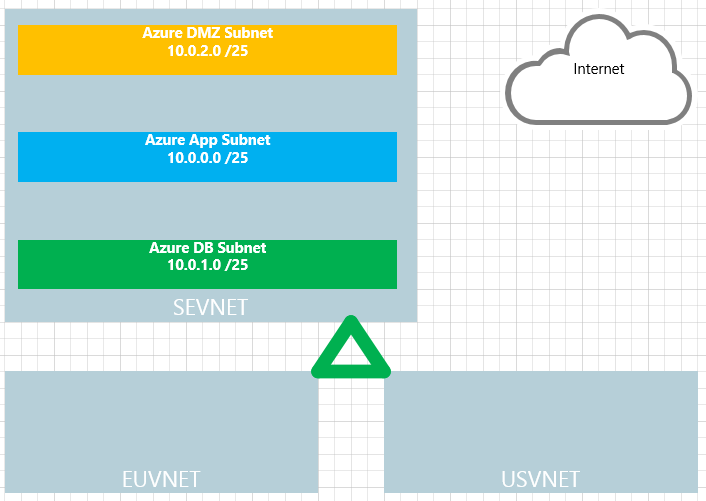 Network Security Groups allow us to control traffic (ingress and egress) on our Azure VNET using rules we define and provide segmentation within VNET by applying Network Security Groups to our subnet as well as Access Control to VMs. What’s the difference between Network Security Groups and Azure endpoint-based ACLs? Azure endpoint-based ACLs work only on VM public port endpoint. NSGs are able to work on one or more VMs and controls all ingress and egress traffic on the VM. In addition NSG can be associated with a subnet and to all VMs in that subnet. Rules processed in the order of priority. Rule with lower priority is processed before rules with higher priority numbers. 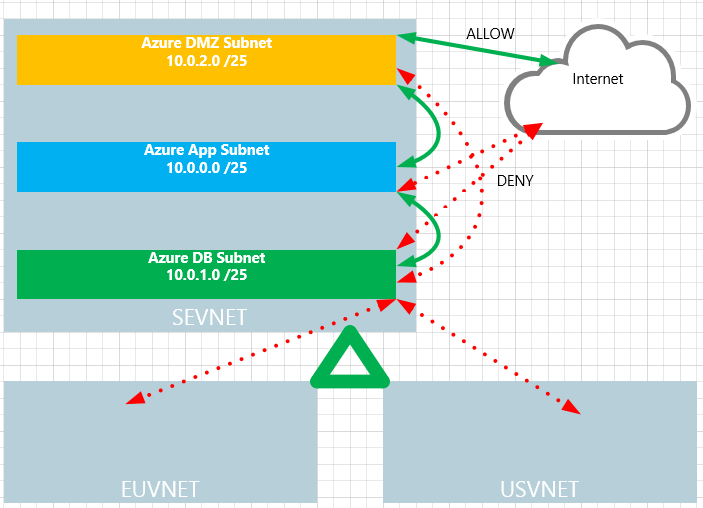 Designing isolated Security Zones within an Enterprise network is an effective strategy for reducing many types of risk, and this applies in Azure also. We need to work together with Microsoft as our Cloud Vendor to secure our Azure environment. Our On-Premises knowledge to create Security Zones model can be applied to our Azure environment. As a demonstration I will pick the simplest Security Zone model which I will apply on my test Azure enviroment just to get some ideas how NSG will work. I will create 3 layers of Security Zone model for my test Azure environment. This simple security zone is only for the demo purpose and might not be suitable for your Enterprise environment. Multi Site Connectivity to: EUVNET (172.16.0.0/16) and USVNET (192.168.0.0/20). After we decided our simple Security Zone model it’s time to lock them down and secure the zones. Section below will show the examples of Azure NSG rules table will look like. Tables above will give us some ideas how to plan our Azure NSGs in order to establish our Security Zones. At the time this post was written, NSG is exposed only through PowerShell and REST API. To use PowerShell, we need version 0.8.10 of the Azure PowerShell module. Personally I will be recommending Azure NSG for every Azure Production deployment I perform in future! Leave a comment below or contact us if you have any questions regarding Azure especially in more complex Enterprise scenarios.